The keyword search is set to search for the words in the Title, Author, Subject, Publisher, and Note fields at a time, or you can limit the words in a specific field (e.g. Title, Author, Subject). Type the words you want to find. Use an asterisk (*) to substitute for one or multiple letters. Words beginning with a common word root Example: engine* will search for engines, engineer, engineering. Multiple asterisks in one word Example: encyclop*dia* will search for encyclopaedia, encyclopedia, encyclopaedias, encyclopedias. Use a question mark (？) to substitute for one letter.Examples: wom?n will search for woman, women.theat?? will search for theater, theatre. Search for an exact phrase by enclosing the words in quotation marks(""). 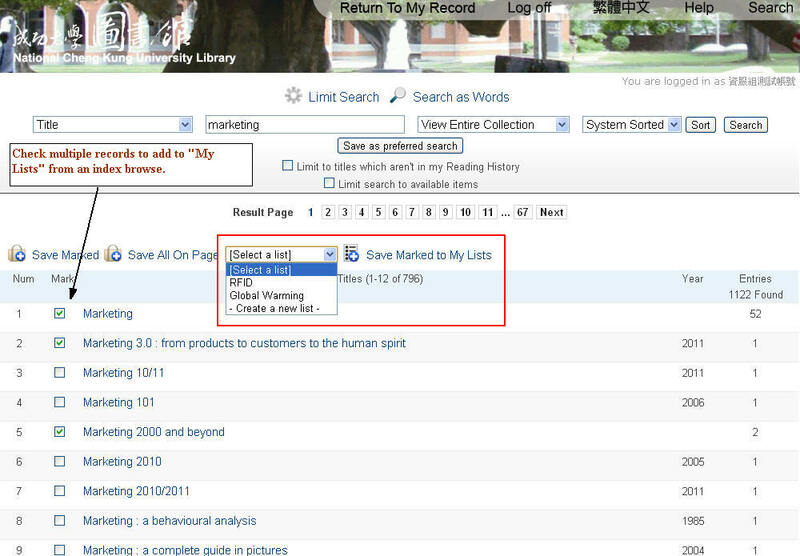 Example： "data mining" "global warming" "English literature"
Type the complete or the initial words of the title. Type the complete or the initial words of the author name. If you don’t know the exact author name, please choose the author keyword search. Type the complete or the initial words of the subject. 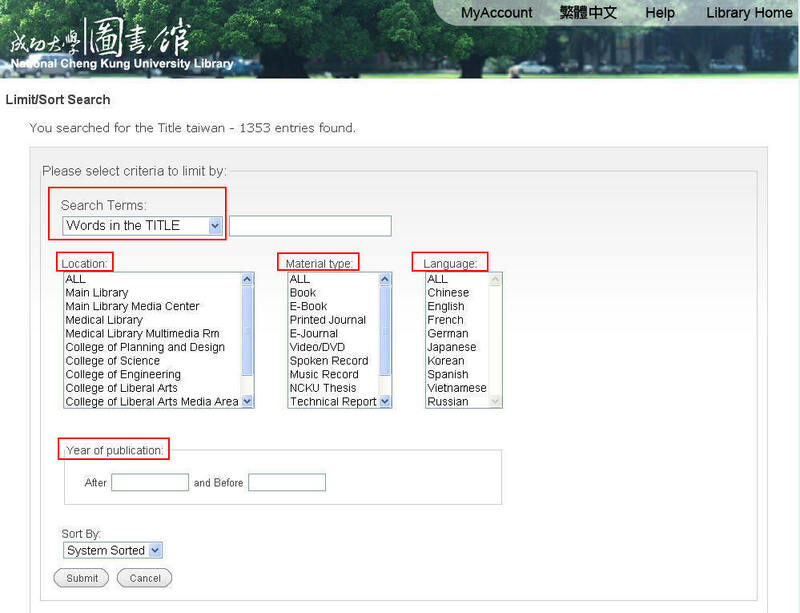 If you are not sure what the exact subject is, please choose the subject keyword search. If there is hierarchical relationship between each subject, type those subjects in a search string. Examples： Politics and culture United States will find the result "Politics and culture -- United States" . If the subject is a personal name, first type the last name then the first name. Type the ISBN (International Standard Book Number) or ISSN (International Standard Serial Number), and the hyphen (-) can be omitted. 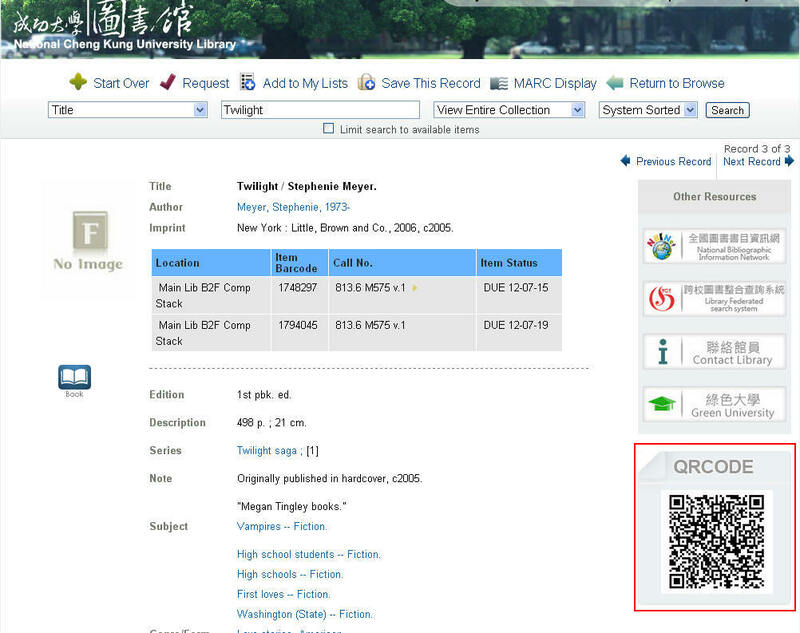 A call number is used to identify and retrieve individual item in the library’s collections. It is a combination of classification number/letter and author number/letter. Type the complete call number or the initial part of the classification number/letter. Enter a space between the classification number/letter and author number/letter. 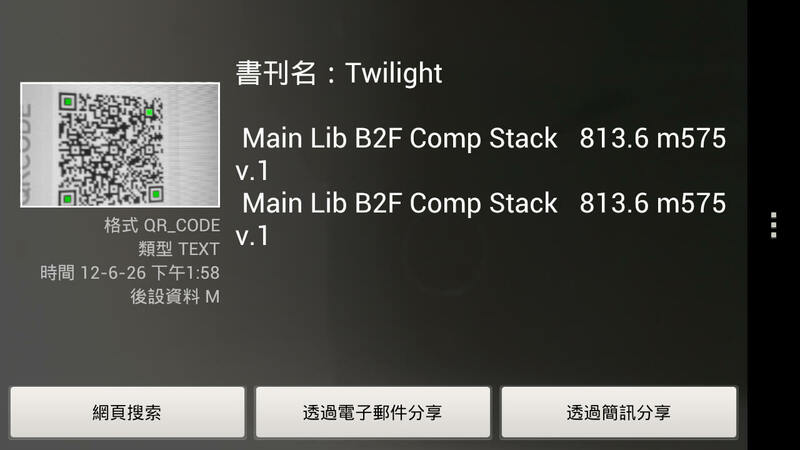 The NCKU Library uses different classification systems according to the language of the work. You can find the materials held in reserve for specific courses by searching for the instructor’s name or the course name. Type the complete or the initial words of the name. 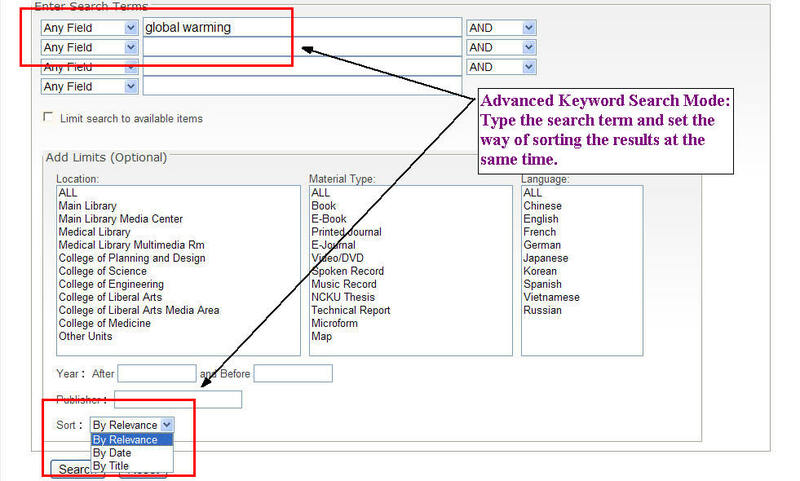 The advanced keyword search can look for the words or phrase in all fields or a specific field (e.g. title, author, subject, note). Use the Boolean operators (And, And Not, Or) to broaden or narrow down the search result. You may limit the search result to a specific location, material type or language, and hold down the CTRL key to select multiple limits simultaneously. 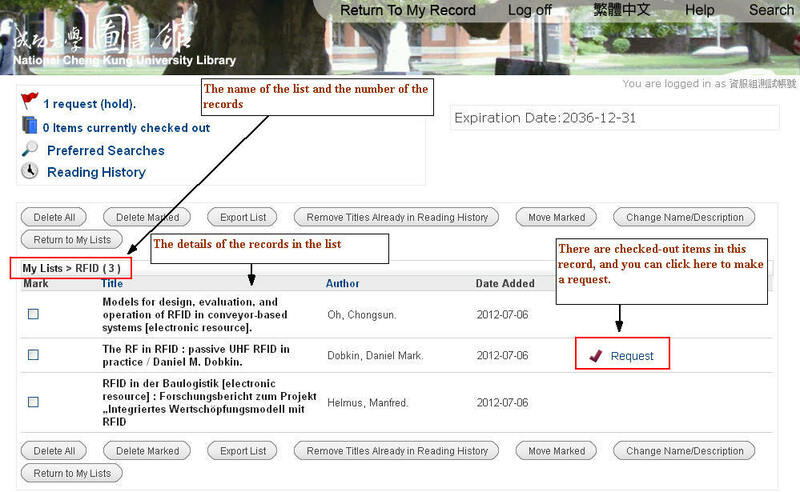 The year limit allows you to retrieve the materials published in a specific year or range of years. The system will exclude the start year and the end year from the range of years. 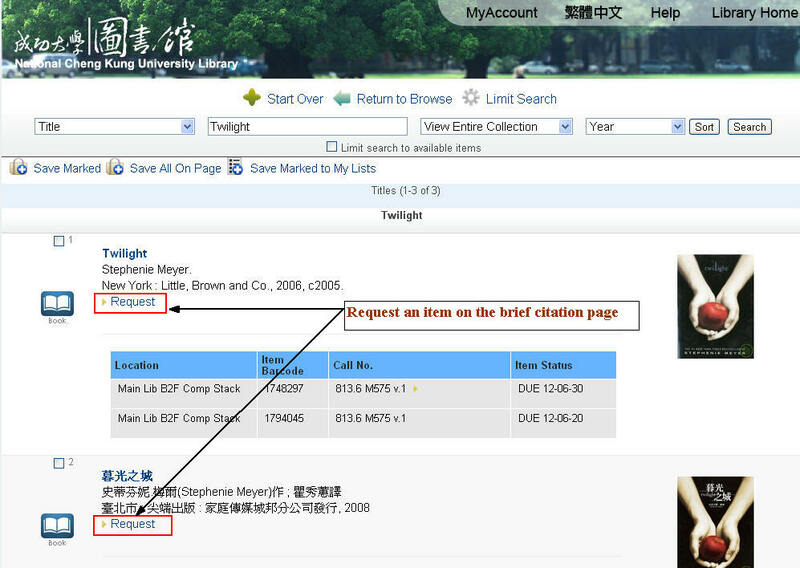 「After 2010 and Before」 search for records published from 2011 to present. 「After 2010 and Before 2012」 search for records published in 2011. 「After 2000 and Before 2012」 search for records published from 2001 to 2011. A unique serial number of NCKU collections. Printed periodicals are shelved by Shelfmark no. in NCKU Library. Type the complete or the initial words of the publisher name. Type the complete or the initial number of the Government Document or the technical report. You may narrow down your initial search results to a more accurate list by using the following limit options. You can sort the records after the search, or set the way of sorting your results at the same time when you type your search term in advanced keyword search mode. 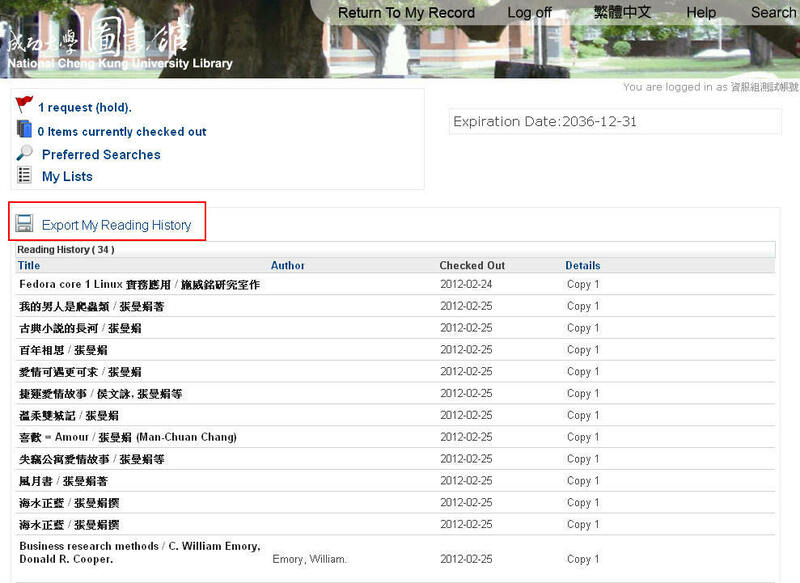 Exclude borrowed items, and only show items that are "available" or "Library Use Only". 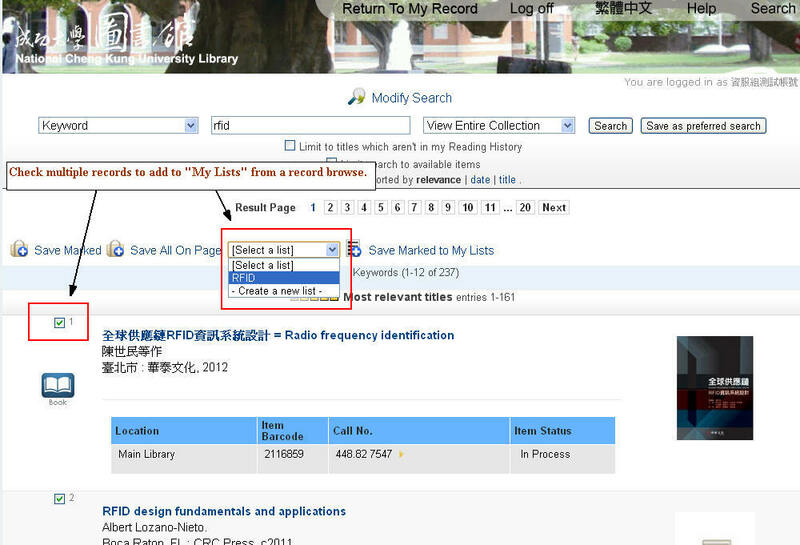 You can browse the search results and save selected records to a temporary list. You have to mark and save records on each page that you view. 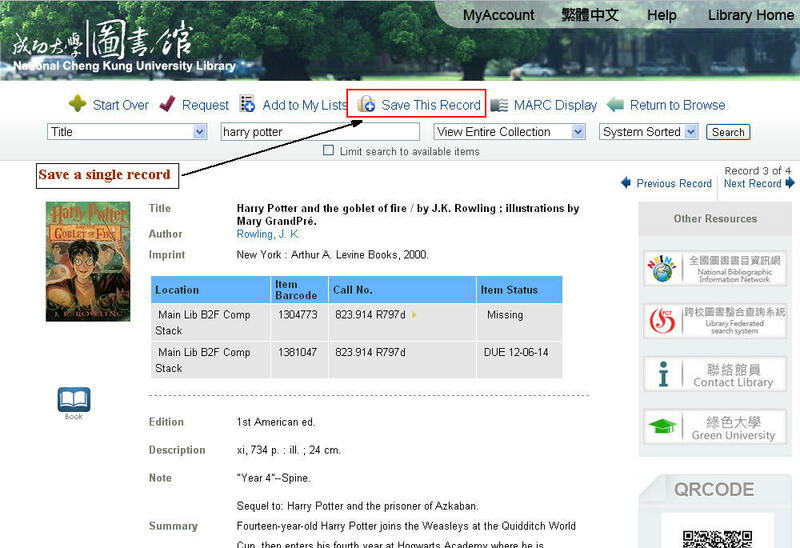 When you have finished searching the catalog, you can select "View Saved Records"M to export records, place multiple requests, or save records to "My Lists". You can save up to 2,000 records to the temporary list. 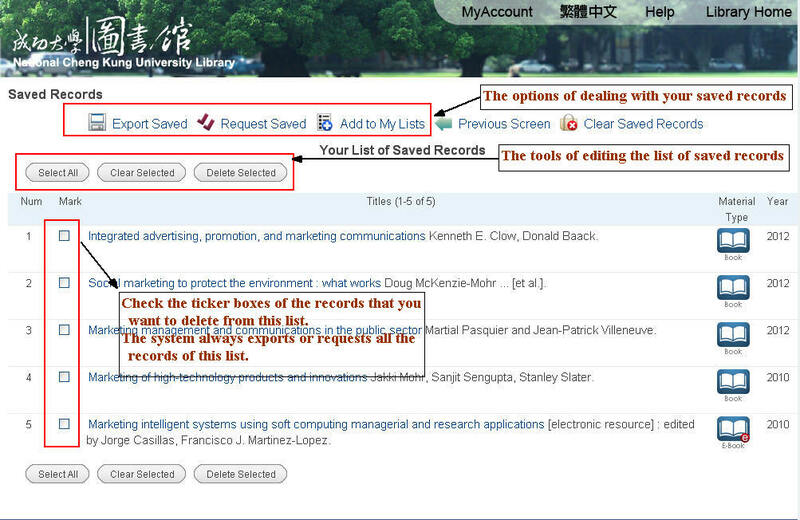 No matter you export or request the saved records, it will export or request all records on the list. 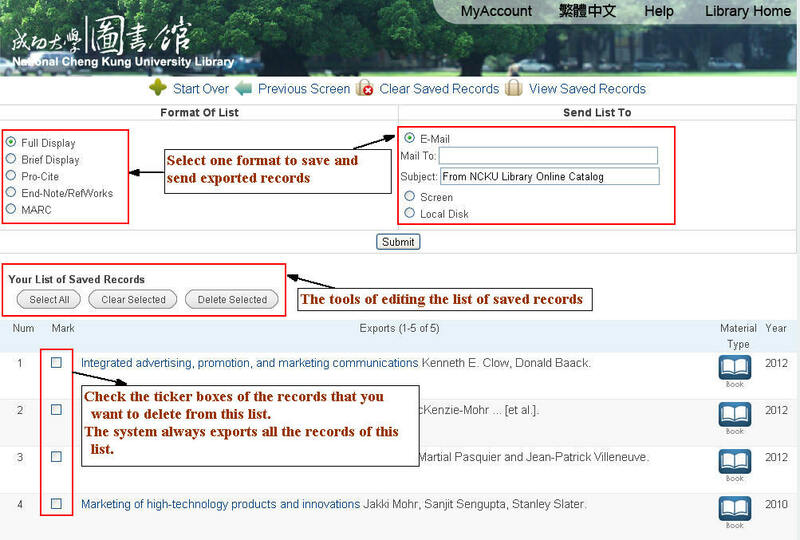 Click on "Export Saved", then choose a format for your exported records and decide how to send the exported records. When you import your exported records in an EndNote format into your EndNote Bibliographic Software, choose the default "INNOPAC Filter" or download the modifiedINNOPAC_NCKU Filter. 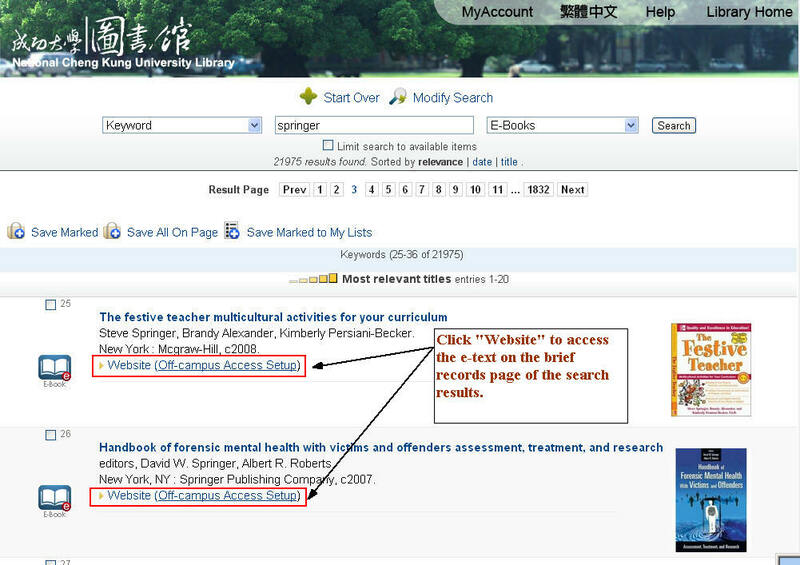 You can access the e-books or e-journals via the linkage shown on the records. 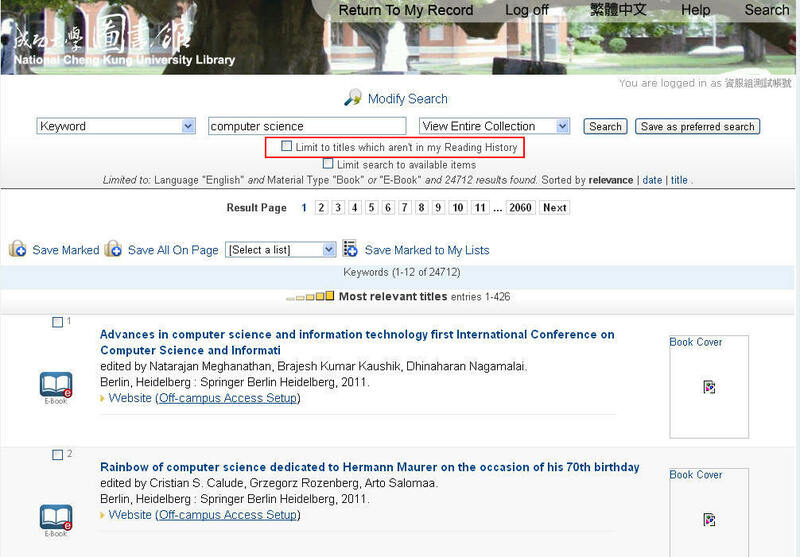 Brief Record: Click "Website" to access the e-text on the brief records page of the search results. 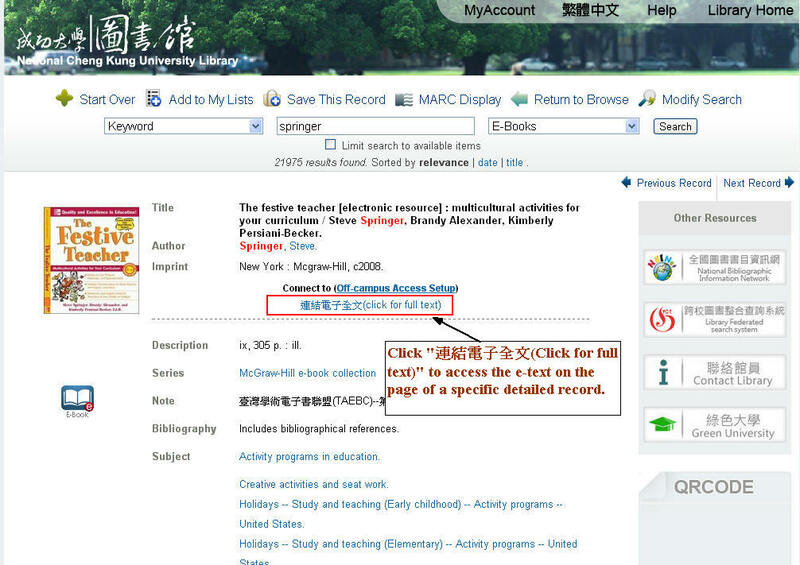 Detailed Record：Click "連結電子全文(Click for full text) " to access the e-text on the page of a specific detailed record. 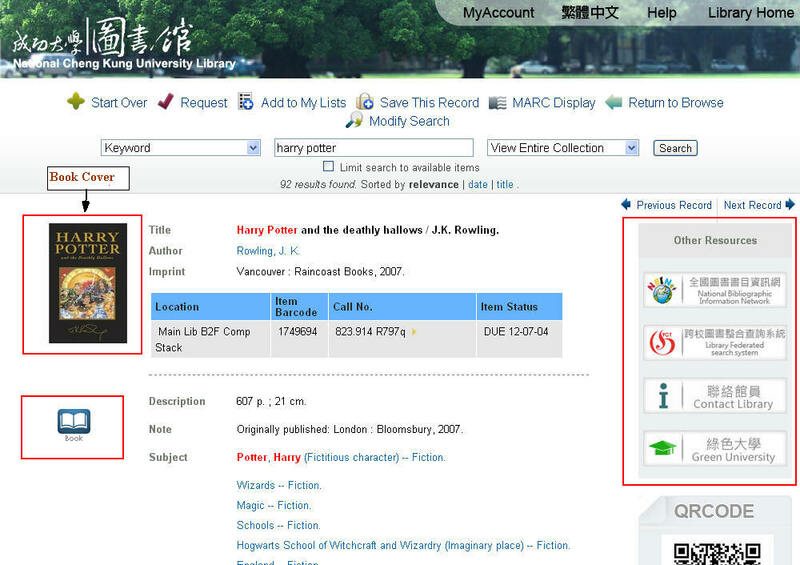 If you want to access the e-books or e-journals subscribed to by NCKU off-campus, you have to set up the proxy in advance. 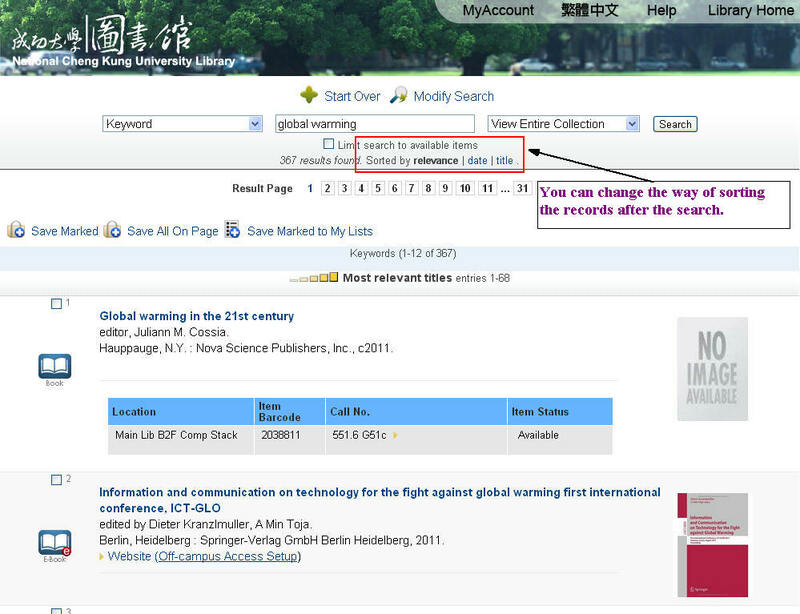 Request a single item: You can request an item on the brief citation page of the search results, or on the page of a specific detailed record. 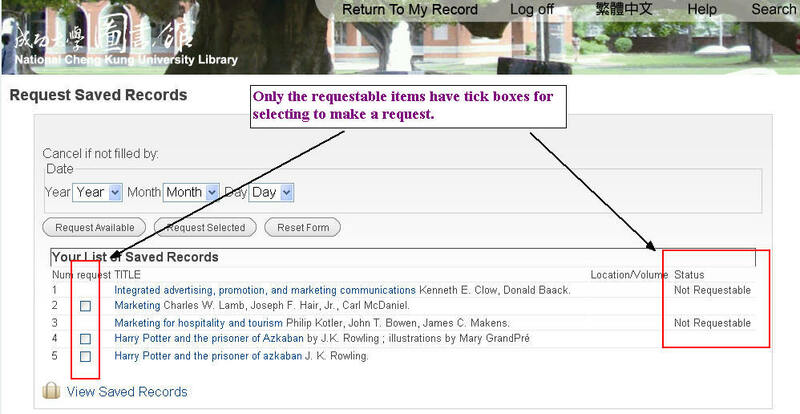 Request multiple items: You can save your preferred records to a temporary list. 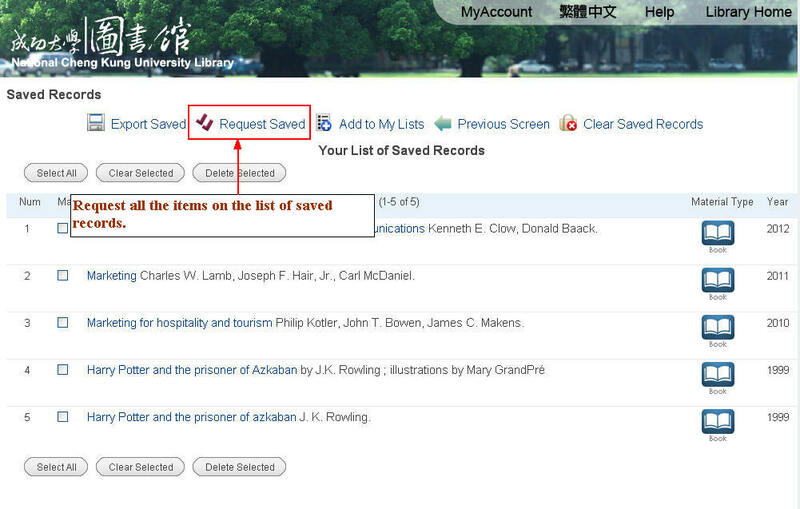 When you have finished your search, you can view your saved records and request all the saved records. The system will let you know which items are requestable, and you can select multiple requestable items to request them simultaneously. You have to login your account to place a request. If you have not logged in your account, the system will ask you to login first. 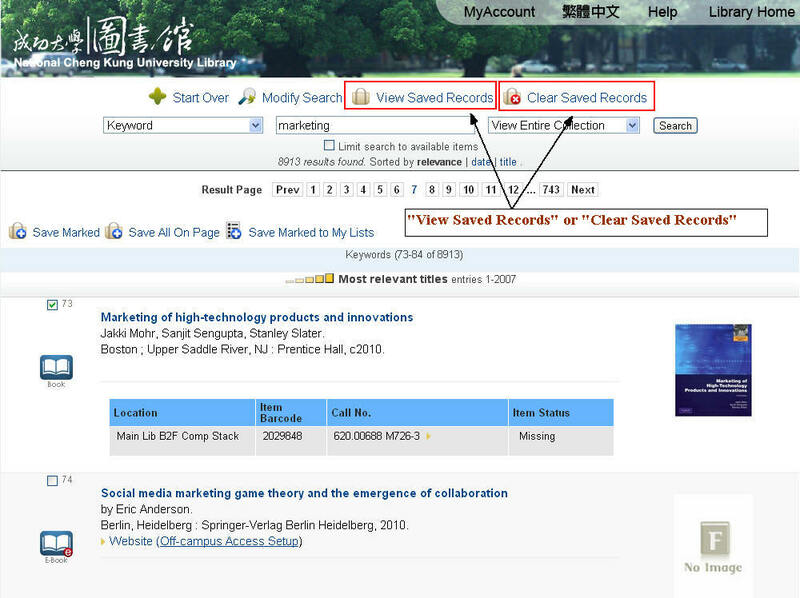 The system will provide different resource links according the material type of the record. Book: If the book that you need has been checked out, or the edition of the book is not what you need, you can make use of the links of other resources to know whether other libraries have the collection or not, and you can apply for an interlibrary loan. 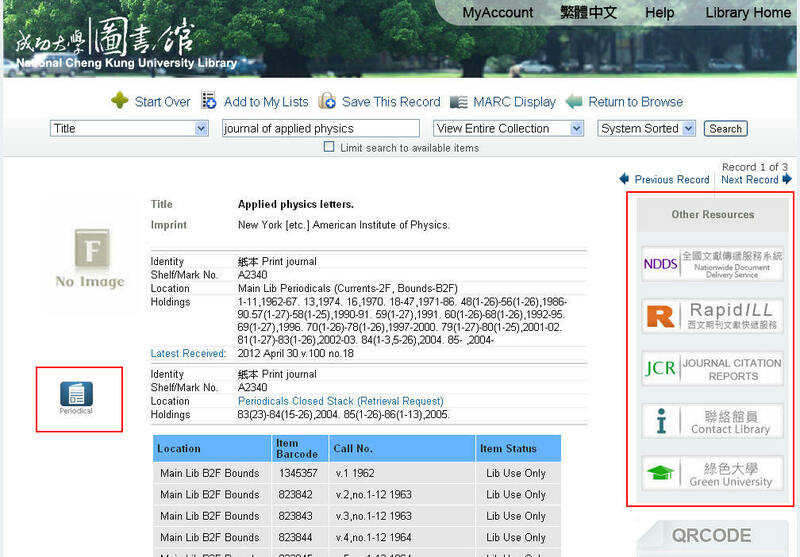 Journal: If the NCKU Library does not subscribe to the specific issue or volume of the journal that you need, you can link other resources to apply for an interlibrary loan. You may click the book cover of the record to get related book information via online bookstore. You can use the smart phone to scan the QR Code of the specific record, and the information of the title, item location and Call No. will show on your phone. 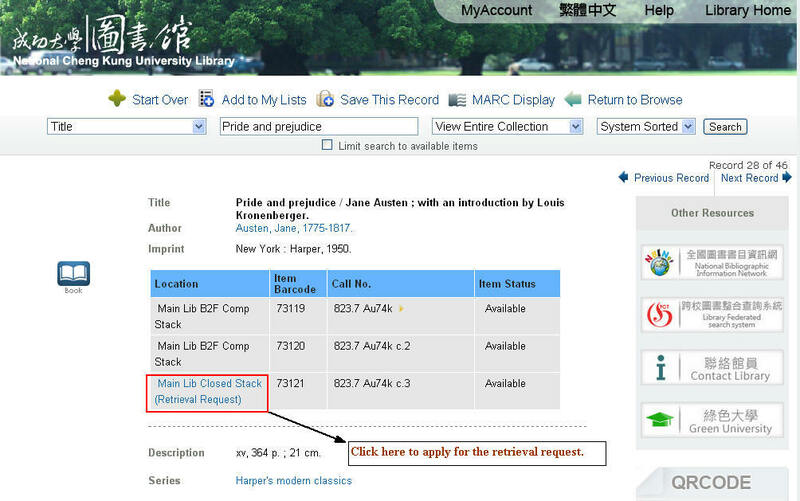 If the item that you need is located in the Closed stack, you can click the location on the webpage and apply for the retrieval request. The Library will inform you when the item has been transferred to the Circulation Desk. The words that you type are case-insensitive. If the book/journal title starts with the following definite articles, you can omit the word when you type. a, an, the, la, le, las, les, un, une, der, die, das. The system can show up to 32,000 records of the search result. If what you search is over 32,000 records, you can make use of advanced keyword search to type the search term with the limit options for getting more exact search result. 「After 2010 and Before」→ search for records published from 2011 to present. 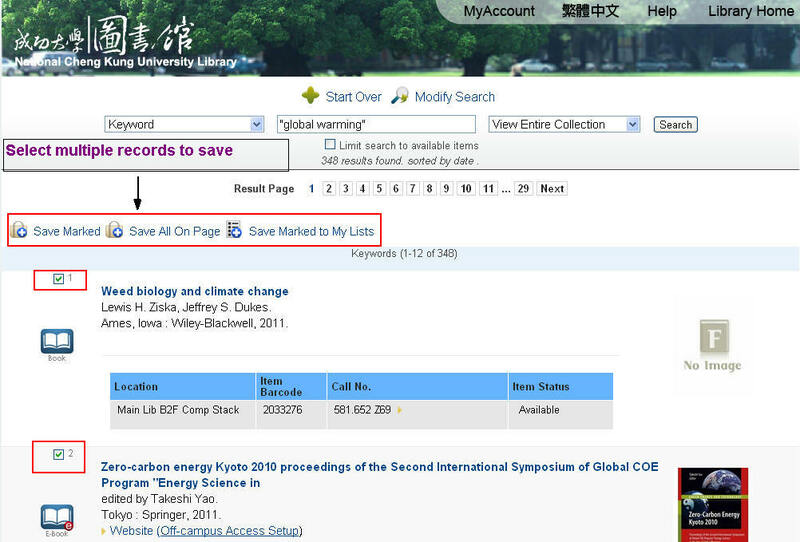 「After 2010 and Before 2012」→ search for records published in 2011. 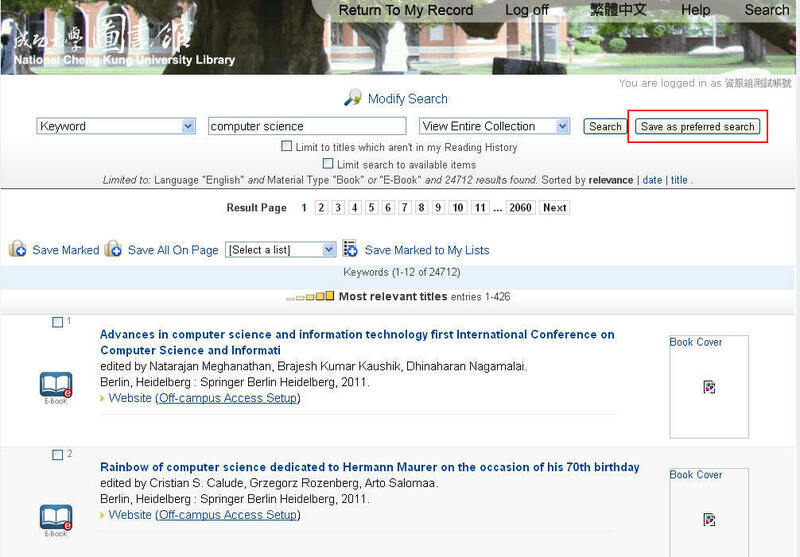 「After 2000 and Before 2012」→ search for records published from 2001 to 2011. 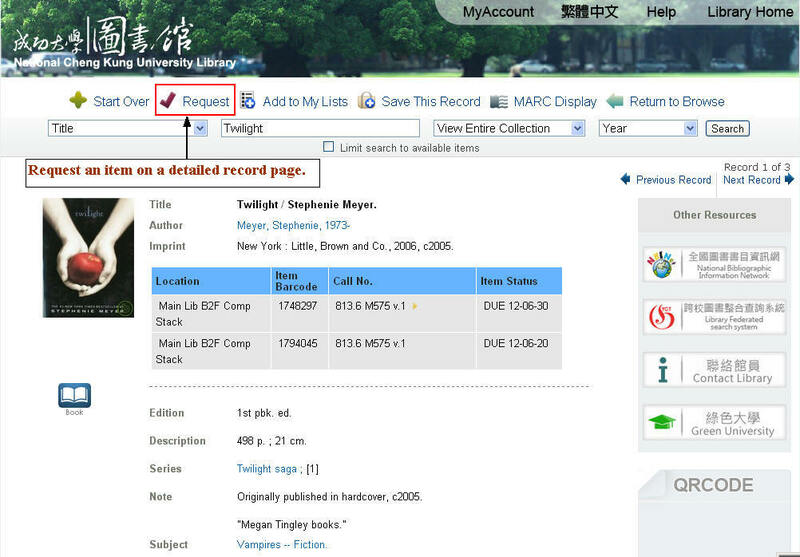 You can view your circulation records, renew or request an item by login to your library account. If you forget your password, you can make an online query. There are the total volumes, the book information, the due dates and the number of times of renewals of the checked-out items in your circulation records. You can renew your checked-out items online if it is allowed to be renewed. Renewal: You may renew your own materials online. All material may be renewed except for materials with reserves and materials on which you owe fines. If you cannot renew items, a message will appear on the screen. If you are successful, a new due date will appear in the "STATUS" column. Always check the STATUS column for information on the success or failure of your renewal. Overdue Items: If you do not return or renew the checked out items on or before the due date, there will be a message of overdue fine shown in the status column of the overdue item. The overdue fine will continue to accumulate daily until the overdue item is returned. You can view and modify outstanding requests or holds. The system will show how many your outstanding requests are and how many of them are "Ready to Pick Up"
Your holds list is sorted by the requested date. If the requested item has been placed on the holdshelf for you, it will show as the first record on the list. Ready. Must pick up by [date]: This item is on hold for you, and it will remain on the holdshelf for you to pick up until the expiration date shown. M of N holds : M is your position in the hold queue, and N is the total number of how many persons are in hold queue of this item now. Due [date]: It is the expiration date that current borrower should return this item. When the current borrower returns it, you will be notified by email to pick it up. Available: You have suspended this hold, and there is no one but you in hold queue. This item is on the Library book shelf now. Cancelling Requests: You can cancel outstanding requests by checking the individual requests by checking the "Cancel" box, and click the "Update List" button to save changes to your holds list. This is the list of what you have borrowed. You can view this list or export all of the records in this list. 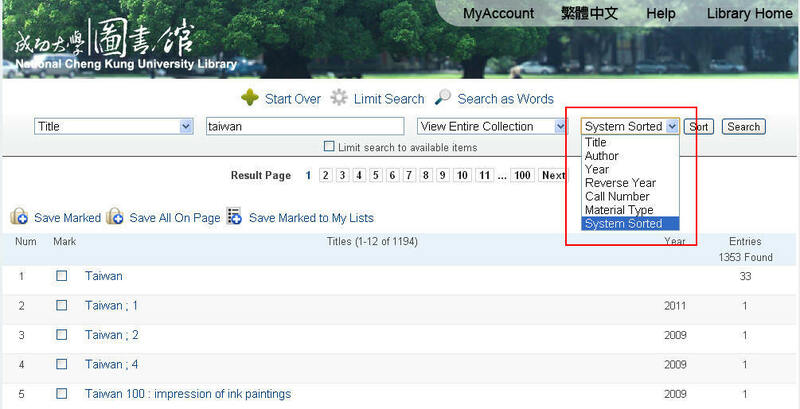 If you have a favorite author or subject for which you often search when using the catalog, you can save the search as your preferred searches. You do not have to key in the search each time. The maximum number of preferred searches that a patron can save is 25. Login to your account and perform a search. Patrons can mark the current search as a preferred search by clicking the "Save as preferred search" button. 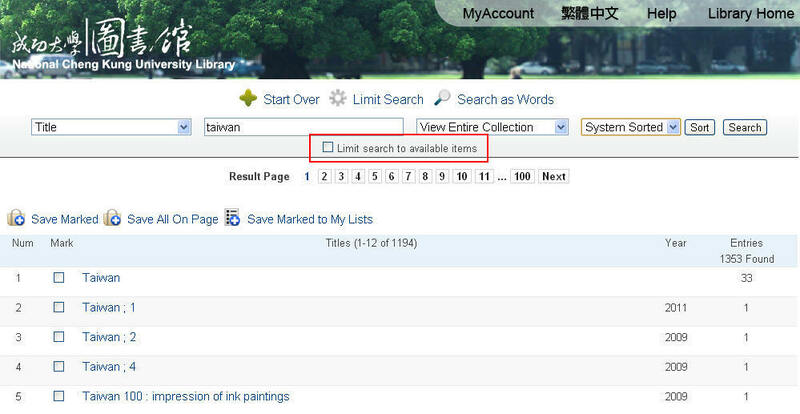 Click the "Preferred Searches" in your account to view the list of your saved searches. Click on the "Search" link associated with any of the preferred searches in the list, and the system will perform a search with that search term. You can create your own book lists to keep track of what you are interested in but have not yet checked out or cannot check out at the present time. 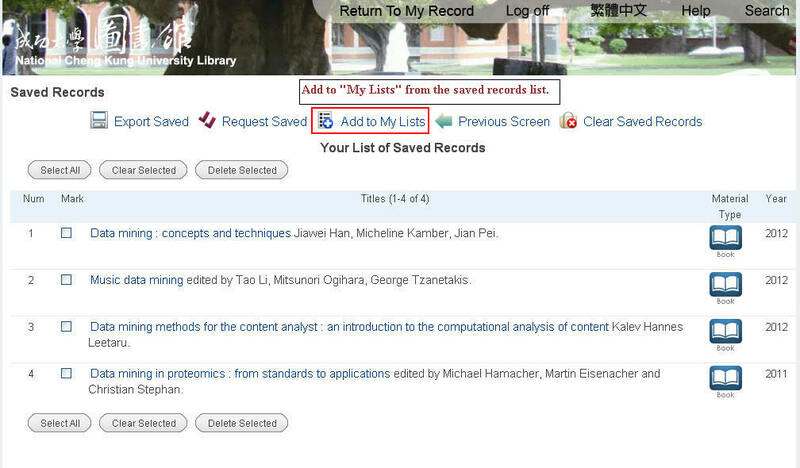 You have to login to your account to you add the records to "My Lists". 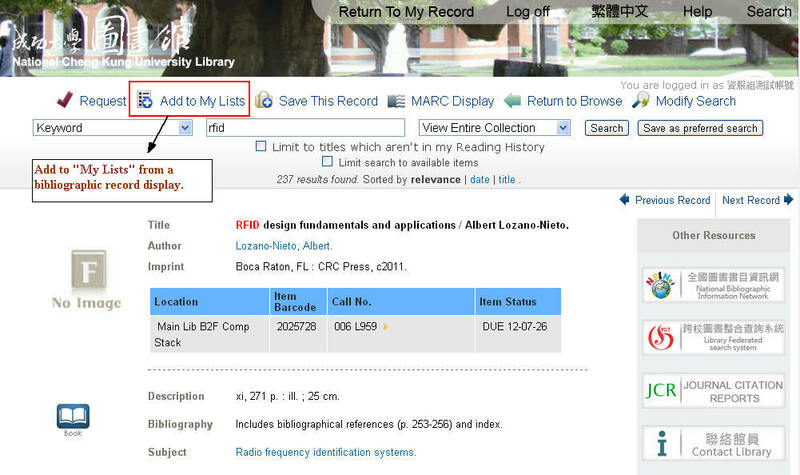 You can add records to a patron record from an index browse, from a record browse, from a bibliographic record display, or from the saved records list. You can create more than one book lists with different topics. Overdue Fines:If you have returned the overdue items and have not paid the overdue fines, there will be a message of "Overdue Fines" shown on your record. 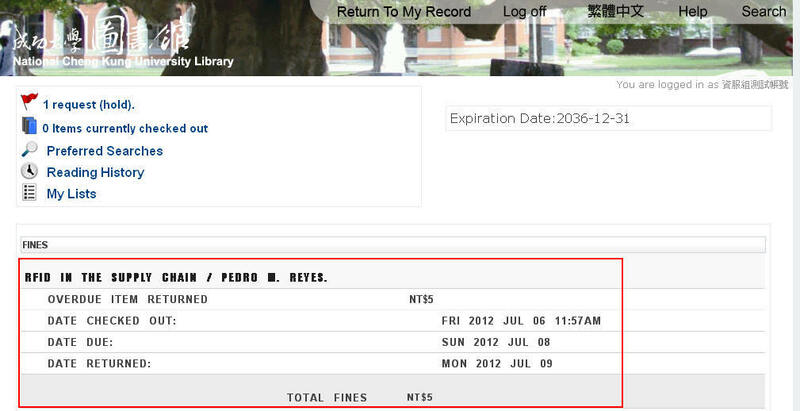 When you click the "Overdue Fines", You can view the details of the fines. If you do not have any overdue fine, there will be not "Overdue Fines" message on your record. Limit to titles which aren’t in my Reading History:When you have logged into your account and perform a search, there will be a limit box at the top of the page that says "Limit to titles which aren't in my Reading History". on the page of your search results. If you check that box and re-execute your search, the system will remove titles that appear in your Reading History from the search results. 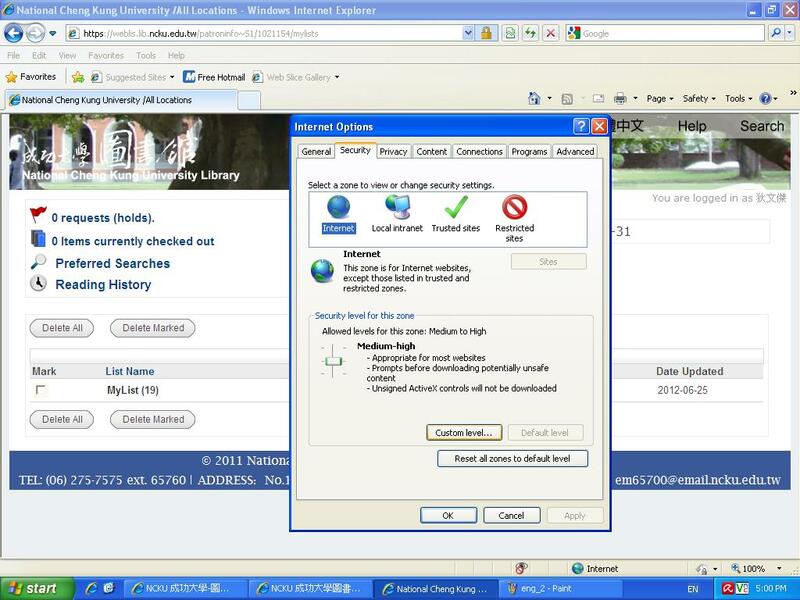 To protect the information security , We encrypt many of our services using SSL, IE will show you a warning message when you access "My Account" service in NCKU Webpac. In the warning message box, you need to choose "Yes" or "No", if you choose "No", some of the images will not display normally. 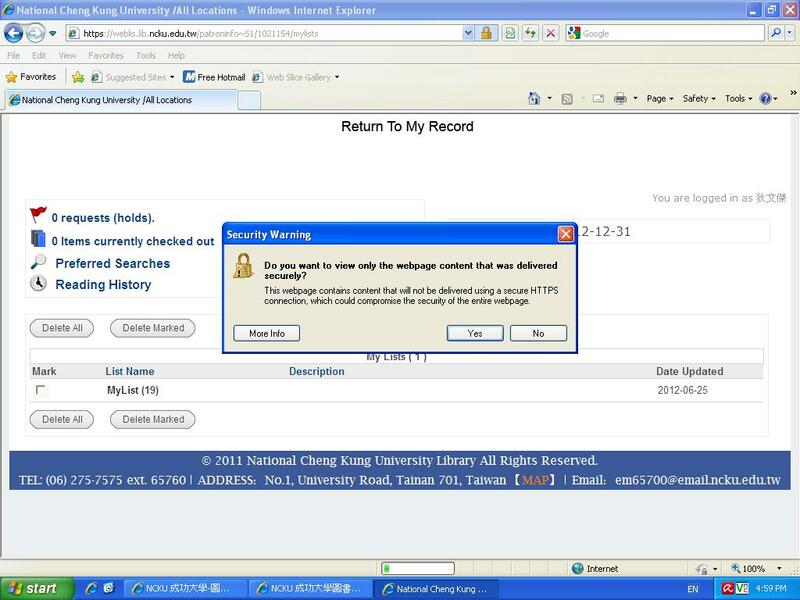 © 2011 National Cheng Kung University Library All Rights Reserved.